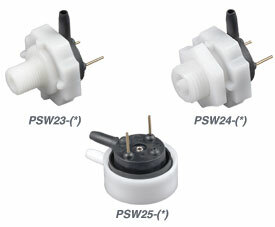 The PSW23, PSW24 and PSW25 Series have been discontinued. Some stock still remains; please check the specific item you are seeking to see if there is remaining inventory. Please see the Pressure Switch Product Finder or contact Omega Sales for possible alternatives. Leads [Optional (-L)]: 8", 20 AWG stranded PVC insulated wire fastened to the switch terminals. Electrical: SPST (N.O. ), 1 amp resistive 250 Vac. Ratings are dependent on actuation pressure and must be derated at lower pressures (under 1 psi). PSW24: Center Spout for 1/8 ID tubing. Provided with 9/16-18 mounting nut. PSW25: Radial Spout for 1/8 ID tubing. Media Compatibility: liquids and gases compatible with EPDM Acetal plastic. Note: Mineral Oil and similar fluids are not compatible with EPDM. Contacts are exposed to media on base spout. 참고: To order models with 8" leads add suffix "-L" to the part number and $5 to the price. Differential models may be used for differential or gauge pressure depending on connections.